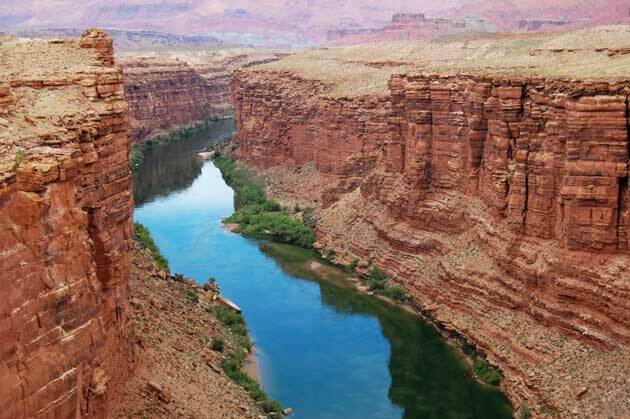 The Grand Canyon—the famous 277-mile-long, Colorado River chasm that cuts through Arizona—ranges from 4 to 18 miles in width and reaches a depth of over a mile. If you do the math right, that’s enough open space for hundreds of trails ranging from canyon cliff paths to low river hikes. But, most of the Canyon’s five million annual visitors just stop at the South Rim’s touristy scenic outlook for photo ops, and move on. Our opinion? That’s practically a hiking sin. If you really want to experience the Canyon (and you’re feeling ultra-adventurous), you’ll need to drive all the way around east side of the canyon to the North Rim, 45 miles south of Jacob Lake, AZ. This is the starting point for the Rim to Rim (R2R) crossing that finishes at the South Rim near Tusayan, AZ. It’s 10 miles across from rims’ edge, but adding the mileage it’ll take for descent, crossing the base and ascent, you’ll hike an actual total of 24 miles. Crossing the Grand Canyon isn’t just a walk in the park. In fact, park officials actively discourage R2R crossings because there’s a high potential for heat stroke, dehydration, hyponatremia and rattlesnakes. The range of temperatures during the day can fluctuate by close to 100 degrees. Plenty of advance planning is required to secure your lodging and train for such an extreme event. Start now and you can spend the winter running up and down stairs and daydreaming about your upcoming spring vacation. Here’s how to do it. Mid-May is the optimal time to attempt the R2R quest. Most years, snow will melt from the North Rim by early May, so the lodges where you’ll need to stay the night before your trek are back in business for the summer hiking season. Plus, the temperatures at the South Rim, while still sauna-like in the 90s, are considerably cooler than the rest of the summer months. But if you can’t make it in May, wait until September, when temps become bearable again. The 24-mile trek is tougher on your body than most marathons and should be approached with the same respect. The big difference? There’s no quitting partway through if you’re injured. Any good marathon training program, including endurance runs of up to 20 miles, will get you into the cardiovascular shape you need to be in, and quad training is crucial. Lunges and squats will prime your legs for the miles of downhill you’ll face at the start as well as the grueling uphill miles at the end. Incorporate stair climbing and hills into your long runs and train in the heat, if possible. Bare essential supplies include waterproof sunscreen, an extra pair of socks, a hat, a camelback-type water bladder, an extra water container and electrolyte capsules, which will help you replace everything you’re sweating out. You’ll also need easy-to-eat, protein-rich foods that are energy dense but don’t weigh too much, like trail mix, nutrition bars, and gels. And obviously, you’ll need hiking boots, but if they’re new, be sure to break them in first—and that they allow enough room to loosen up the laces after the first few miles for comfort. Your water capacity should total at least 100 oz., and you can fill your reservoirs whenever you pass one of the fountains, which are located at Roaring Spring, Cottonwood, Phantom Ranch, Indian Garden, 3 Mile House and 1 1/2 Mile House. Bring your camera (that’s a no brainer) but leave your cell phone behind: the only coverage in the canyon is near the Phantom Ranch and even there it’s spotty at best. An extra quick-dry t-shirt is also a handy thing to pack. Once you sweat through your first shirt, you can swap it out for a dry one and hang the other by carabineer outside your pack. Swapping from wet to dry t-shirts over midday’s scorching hours will be an added comfort bonus. Start your trek at sunup on the North Kaibob Trail accessible at the Kaibob National Forest on the North Rim. It doesn’t feel much like desert here, where the temperatures hover around freezing in the morning. 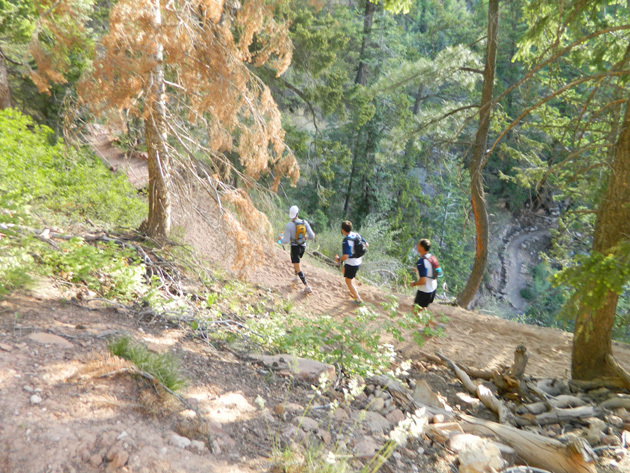 You’ll descend nine miles through pine forest as the sun rises over the canyon. At the bottom, the trail turns sandy and runs through fields of cacti. Beware, rattlesnakes sun themselves on the hot, dusty ground. The next seven or so miles across the base of the canyon is known as The Box and is at least 20 degrees hotter (120-degrees Fahrenheit) than the rest of the canyon. Power through and reward yourself with a beer at Phantom Ranch. You can pre order a box lunch as well, which will be waiting for you when you arrive. Try not to overeat though, because after Phantom Ranch, the ascent out of the canyon is the toughest part. Take Bright Angel Trail to finish at the South Rim because it has several water stops along the way. And you’ll need them. You’ll face miles and miles of steep switchbacks as you make your way up, and though you’ll be huffing and puffing, the view from the top is totally worth it.